Looking for a bonfire and fireworks display in Northamptonshire or it’s local Borough, this bonfire night 2019? Check out our guide! Why not come and join us on the Seasonal Forum. Where you can find more events in Northamptonshire, and deals from our sponsors, with help from our excellent community. Time: Gates open at 7 pm with the Fireworks at 7.30 pm. Venue: Rothwell Conservative Club, 7 Market Hill, Rothwell, Northamptonshire, NN14 6EP. What’s on: Hotdogs and Burgers available, Fun fireworks, and a great night for all. Price: Tickets £2 Adults and £1 children, Tickets available from Rothwell Conservative Club. Learn More: View Here to see more about the event. For a safe fun night at any of these Northamptonshire Firework Displays Round Up 2019, Please follow the rules, as most displays do not allow to sell or buy fireworks or allow animals. Please take extra care if you are attending on your own, take the extra money and a mobile phone for emergencies only. Did you enjoy this Northampton Firework Displays Round Up post? Please share it with your friends. Would you like more? we are always looking to keep up to date with all local events. This a labour of love, if you share this post please credit us. Have we missed any? 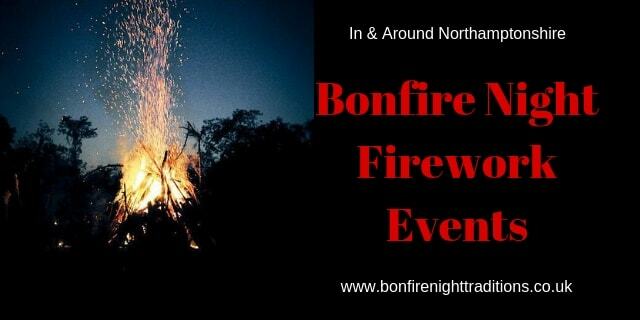 Let us know by emailing info@bonfirenighttraditions.co.uk.